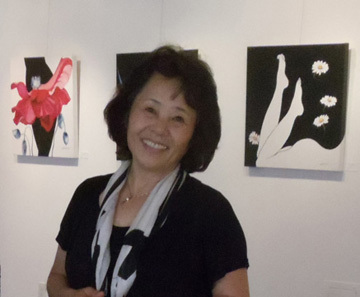 Mariko Irie, a lifelong painter, was born and raised in Tokyo and currently resides in Mendocino, California. She has been in numerous solo and group shows and her work is collected privately and publicly throughout the U.S., Japan, England, Germany and Canada, including the Miasa Governor in Japan. 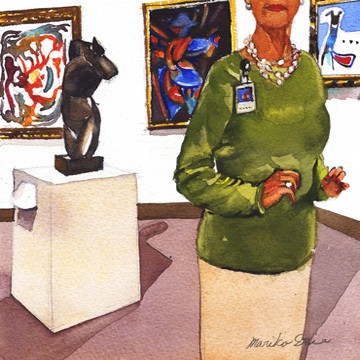 She has been exhibiting in galleries for the past 22 years. My mother watched me enjoying painting when I was in preschool and took me to a painting class when I was an elementary school. Up through high school, my media was oil pastel, which is very common for children - so was crayon, but I didn’t like it. I won prizes for my paintings. When I was a high school, I got an oil paint set. I used to go out and paint by the river. I loved painting and drawing all the time, but I was not thinking I'd ever be a painter or an artist. One of the reasons why: my art teacher in high school was great - but the substitute who had just graduated from an art university came to teach us. She believed that only abstract painting was Art. She criticized my paintings so badly, I quit painting in class. Then I was became fascinated by the idea of becoming a designer. So I went to art school to prepare for the entrance examination for Art University and studied drawing and composition. I passed the examination for Musashino Art University in Japan and my major was Interior Design. After graduating, I became an interior designer. The economy was a bubble at the time, so I was making great money. But after ten years, I felt something lacking in my life; there was a hole in my body. I quit my job and married, but that was not answer either. It took me long time to figure out the answer. Right before I was turned forty years old, I asked myself: If I knew that I would die tomorrow, what would I want to do? The answer was painting. 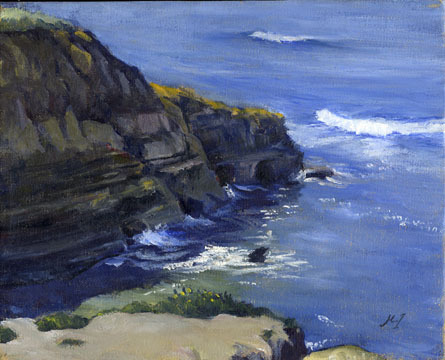 After I settled in Mendocino, I started painting again. Galleries started to show my work in 1989 and since then, I have never stopped painting. I have two sons; the younger son was two years old in 1989, when I moved out from my ex-husband’s. First, I was taking classes at the college and the classrooms were my studios. When my sons started to go to school, our living room was my studio. Five years later, we moved into a bigger house and I got my own studio space. I worked on my art when they were at school and until they got driver licenses, I was their driver. I was happy to do so, because I wanted to enjoy them. It was precious time in my life and I knew it wouldn’t last forever. Now they have both graduated from universities and have their own lives. In 1989, I took a printmaking class at the College of the Redwoods. I did etching, monotype and serigraph. During my first exhibition at the college, my etchings sold. So I took them to show at a gallery and they started to sell them. I felt so lucky. In the late 70’s in Tokyo, I saw “American Super Realism” paintings. It was sensational. I was fascinated by these paintings. They were such a simple concept; the painters were painting exactly what they were seeing and they were somehow even more realistic than photography. At one point, I became allergic to oil paintings and all solvents, so I switched to watercolor. 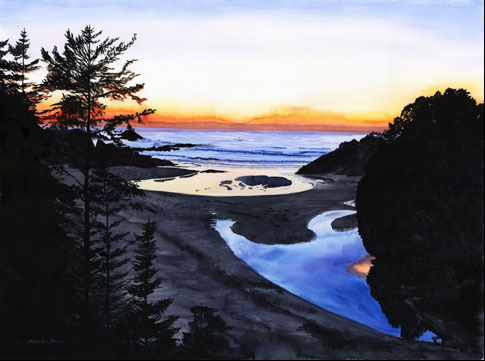 I've painted watercolor for over twenty years now. It’s an incredible media. If we try to control it, we end up losing control. But if we let watercolor paint itself, it creates a fascinating painting. Three years ago, I moved to San Diego. The climate there is much dryer than Mendocino. My watercolor technique wouldn’t work well, because it would dry too fast. I joined the plein air groups and took water-mixable oils. I learned from other artists how to paint fast. It was a big challenge for me, but it was great, even with the struggling. I’m having fun with water-mixable oils now. 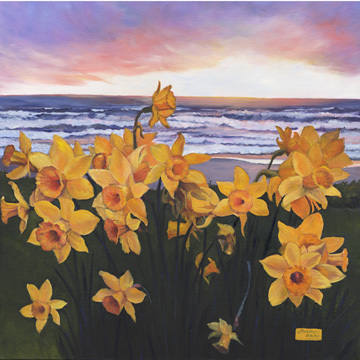 Many of your paintings are set outside - at the beach, during sunrise or sunset. There's such a lovely quality of light in your art, as if we're actually seeing real sunlight. What can you tell us about you make your work look so true to life? Thank you for saying that, it's a big compliment. Sunset, sunrise. The beautiful moment is so short. I can’t paint fast enough at the location itself - especially an 11” x 30” watercolor painting, which takes about a week to finish. So I take photos. I spend time staring at the scene, trying to absorb the light, shadow and colors. Then I paint at my studio. 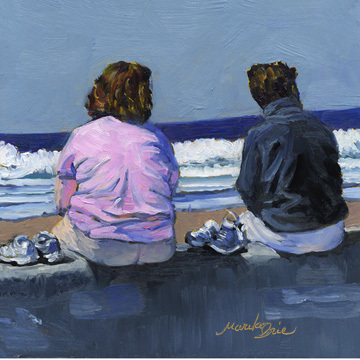 When I start to paint, I don’t think of any one thing, I'm just in my painting world - and then - the painting is finished. From my experience, when paintings are done this way, they make the best ones. Procrastination: I can’t do it! It’s my nature. If I know that something should be done, I have to do it right away. Otherwise, it just sticks in my mind and I can’t do anything else. But sometimes, there are too many things to be done, so I just make a schedule and a check list. Having a solo show at a gallery. That makes a good excuse for focusing on painting. A lot of times, I work from photos. When I’m staring at an image, I start to remember that moment. During other kinds of my paintings, for example, “Opening of Happiness,” I just think “What is happiness?” and the image comes from that. Sometimes a gallery will have a group show with a theme. For instance, the last theme show I did was “Love Note” and I painted “Encounter” and “Art Lovers” for that. When I’m exhausted, whatever I see looks horrible, so I take a nap. That helps a lot. Or I might change the subject for my paintings or play on the surface of painting to create a new technique. It’s a part of learning the media all the time, a process that always stimulates me. Taking trips helps me a lot too. It takes my mind out from studio, then I come back renewed, with a vision. I’m so lucky to be an artist, because I'll be learning forever. It refreshes my life all the time and now we have all this information through the internet. Art is forever and alive. When my paintings come out better than I imagined. When people smile in front of my paintings, I’m very happy; it's like my paintings have brought joy to this world. When somebody falls in love with my painting and brings it into their home, that makes me so happy. I feel that I connected with them through my painting.